Worried that you’re going to run out of storage on your phone? Then you’ll be excited to hear that Western Digital just announced its 400GB SanDisk Ultra microSDXC card – the world’s highest-capacity microSD card. With enough capacity to hold 40 hours of Full HD video and transfer speeds of up to 100MB/s (fast enough to move up to 1,200 photos per minute), you’ll never be without the content you want. According to Western Digital, they accomplished this capacity increase by leveraging their proprietary memory design and production processes to allow for more bits per die. Western Digital has also updated the SanDisk Memory Zone app, available for free from Google Play, which allows users to easily locate, organize, transfer and back up data, including tagged content from Facebook and Instagram. That will come in handy when you have 400GB of content to manage. 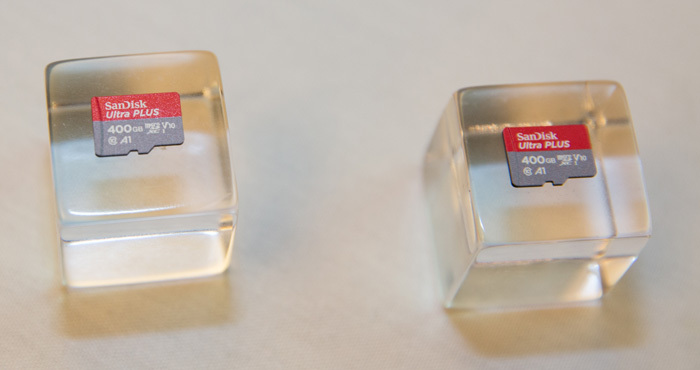 The new 400GB SanDisk Ultra microSDXC UHS-I card will be available at SanDisk.com and other major retailers for $249.99 and will come with a ten-year limited warranty.